Guns N’ Roses have taken to social media to mock Aerosmith frontman Steven Tyler – and others – who have come forward with claims that they played a role in the band’s 2016 reunion. "Guns N’ Roses would like to respectfully thank the many people taking credit for our upcoming shows and everything in between,” posted the group. “Especially those whom we haven't spoken to in numerous years who, through the power of media, have somehow served a pivotal, even if non-existent, role. We and the fans thank you!" The note takes direct aim at headline-making comments Tyler made to Howard Stern on his SiriusXM radio show earlier this week. “In fact, it was Jon Bon Jovi. I'm in rehab. He calls me up and goes, 'What the f*** are you in rehab? The world needs you. We're out here ripping it up, and everybody's asking for Aerosmith. You need to get out of here, because people in the world need you.'" “And also, I'm the lead singer of another great band, so I have a right to feel that way,” he added. “I have such a huge ego about keeping the fire and the music together. Because if people come up to me and say, 'Dude, I got laid to your music,' or a woman comes up to me and says, 'We got married to your songs.' You had something to do with the fabric of people. Guns N’ Roses had something to do with the fabric of humans on this planet, so I get f***ing pissed." Earlier this year, comedian Andrew Dice Clay claimed he helped Guns N’ Roses reunite via a series of one-one-one conversations with Axl Rose, Slash, Duff McKagan and longtime friend and band manager Tom Mayhew that led to a February 2015 Happy Birthday tweet by Slash to Rose that appeared to be the first attempt at communication between the pair in years. 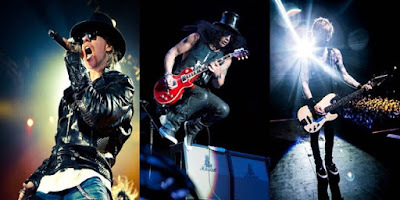 The confirmed Guns N’ Roses lineup of the three members will launch a reunion run with a pair of shows in Las Vegas on April 8 and April 9 before headlining sets at Coachella on April 16 and 23.